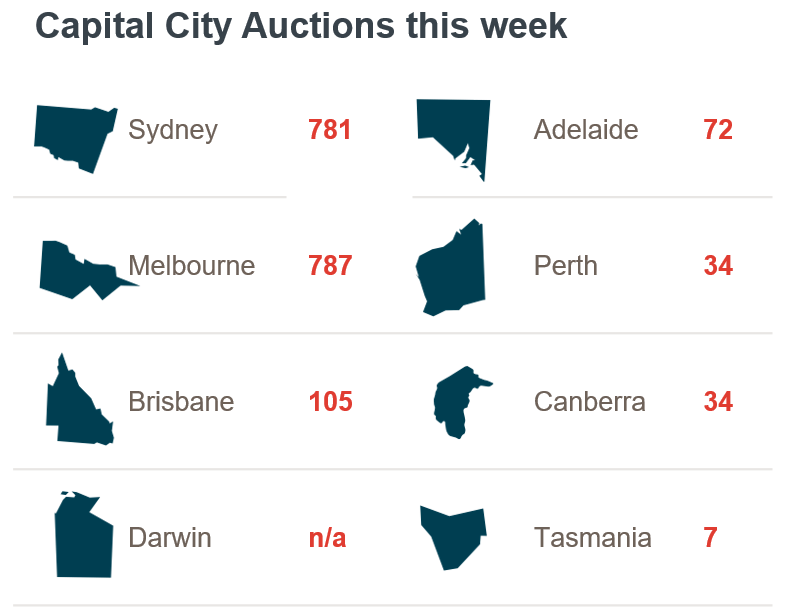 This week, the number of auctions scheduled to take place across the combined capital cities will fall, with 1,820 auctions currently being tracked by CoreLogic, down from 2,355 last week. Although volumes are down this week, current levels are significantly higher than the same week last year, when auction volumes were quieter due to the Federal Election when just 841 homes were taken to auction. Across the two largest auction markets, Sydney and Melbourne, volumes are similar this week with both cities expecting just over 780 auctions each. Melbourne has seen the largest fall in auction volumes week-on-week with current volumes -25 per cent lower than the previous week, while Sydney volumes are down around -17 per cent compared to last week. Across the smaller markets, volumes will fall in all regions except Tasmania where volumes will remain unchanged. Brisbane is set to host the most auctions this week with 105 auctions currently scheduled, followed by Adelaide with 72 auctions. Both Canberra and Perth will host around 34 auctions each this week, half the number held over the previous week in Canberra. This week, Randwick in Sydney is the busiest individual suburb for auctions, with CoreLogic tracking 17 auctions so far this week. Following Randwick is Blacktown, also in Sydney, and Reservoir in Melbourne, each with 13 scheduled auctions. The final clearance rate across the combined capital cities continues to fall for the 5th week in a row, with last week recording a final clearance rate of 66.5 per cent, down slightly from 66.7 per cent the previous week, making it the lowest clearance rate since the week ending 26 June 2016 (66.4 per cent). There were 2,355 homes taken to auction last week, slightly lower than the previous week (2,444), but higher than the same week last year (2,218). Clearance rates across Melbourne and Sydney were relatively stable week-on-week, with Sydney recording a clearance rate of 68.2 per cent across 939 auctions last week, compared to 68.0 per cent across 927 auctions the previous week. Melbourne recorded a final clearance rate of 70.7 per cent across 1,047 auctions last week, down slightly from 71.0 per cent across 1,129 auctions over the previous week. Across the smaller auction markets, performance was varied last week, with clearance rates improving in Canberra (67.2 per cent) and Perth (39.6 per cent), while Adelaide, Brisbane and Tasmania saw clearance rates fall over the week. Looking at the non-capital city regions, the Hunter region was both the busiest and most successful region last week with 62 auctions held and a clearance rate of 75.0 per cent.